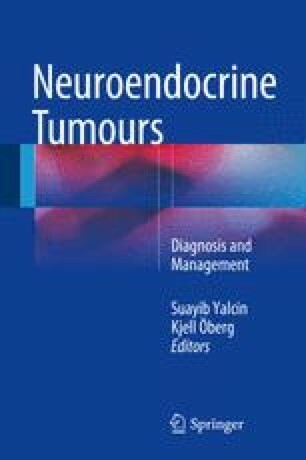 Somatostatinomas are rare neuroendocrine tumours (NETs) that arise in the pancreas or duodenum. They are the fifth most common pancreatoduodenal NET (after insulinomas, non-functioning tumours, gastrinomas and VIPomas), with an incidence of 1 in 40 million [1–3]. They tend to be non-functioning, although they are rarely active and can produce a spectrum of symptoms called ‘somatostatinoma syndrome’ [4–6]. A degree of discord exists regarding the functional component of a somatostatinoma; some clinicians argue that a ‘syndrome’ of clinical symptoms must be present for the diagnosis of somatostatinoma and others that the diagnosis is purely immunohistochemical . As most of these tumours are biochemically inert, they are either detected incidentally or by causing mass-effect pressure symptoms, and most will have metastasised by the time of diagnosis [6, 8, 9].